Britney Spears will guest star on an episode of "Will & Grace," NBC announced Tuesday. The pop star will appear as a Christian conservative sidekick to Sean Hayes' character, Jack, who hosts his own talk show, on the April 13 episode, the network said. Jack's fictional network, Out TV, is bought by a Christian TV network, leading to Spears contributing a cooking segment called "Cruci-fixin's." As a young girl, the 24-year-old Spears was a regular on "The Mickey Mouse Club." After becoming a pop singer, she starred in the critically panned 2002 film "Crossroads." Last September, Spears gave birth to her first child, son Sean Preston, with husband Kevin Federline. Two of the biggest R & B divas in the world are teaming up to record a duet. Angelina Jolie On Brad Pitt: "We Will Never Marry"
According to Star magazine, Jolie was overheard saying to director, Roger Rodriguez: "We will never marry". Pink Not Pregnant - Newlywed pop star PINK has rubbished reports she plans to start a family with new husband CAREY HART, insisting she wants to focus on her career. The FAMILY PORTRAIT hitmaker, 26, is horrified by the effect motherhood has had on her rival BRITNEY SPEARS' career and is determined not to suffer the same fate. All Eyes on the Ears: Long earrings ruled the Golden Globes' red carpet, and those looking to turn heads did so by opting for colorful danglers that showed off anything-but-ordinary jewels. In addition to boosting individuality and raising the edginess factor, "color is more youthful than diamonds on their own," says jewelry designer Lorraine E. Schwartz, whose gems adorned Evangeline Lilly, Geena Davis and Kate Beckinsale, among others, at this year's awards show. Color Me Happy: Want to add a dash of color to your own accessory closet? There are no hard and fast rules. Use a unique hue to offset a gown in a neutral color or to bring out the color of your eyes or your dress. Above all, "jewelry should stand on its own," says Schwartz. Balancing Act: Keep everything in proportion. If you're doing big earrings, nix the necklace. "My favorite look is a great earring and a great hand with a great set of bracelets or a big ring with a great earring," says the designer. If you do a significant necklace, "you have to do a smaller earrings like studs," she adds. What's a celebrity to do? Star in a movie or take a vacation? That was the dilemma BEYONCÉ faced when she was asked to star in the remake of 'The Pink Panther,' in theaters February 10, 2006. "I only had a month and DESTINY'S CHILD was going back in the studio, so I had to decide, 'Am I going to do a movie or am I going to go on vacation?'" Beyoncé revealed. "I thought I was going to go on vacation until they told me the offer was from 'The Pink Panther.' I was, 'The Pink Panther'! That's amazing. STEVE MARTIN, that's even more amazing." In the updated version of the 1963 film, Martin re-interprets the role of the bumbling police detective, Inspector Clouseau, made famous by PETER SELLERS, while KEVIN KLINE takes on the role of Chief Inspector Dreyfus and French favorite JEAN RENO is Ponton, Clouseau's new sidekick. Beyoncé fits right in with her role as Xania -- an international pop star -- who happens to become a murder suspect! "You don't know if Xania has a crush on Clouseau or if she is using her sexuality as a weapon," the pop diva admits. The plot concerns a world-famous soccer coach who has been murdered and whose priceless ring -- a stunning diamond known as the "Pink Panther" -- has been stolen. The French government needs a master detective to solve the crime -- but he's not available -- so it's up to the bumbling Clouseau to save the day! "Xania is very fashion forward," Beyoncé says. "Every outfit gets better and better. Joe Aulisi came to my concert and showed me some of the sketches and I couldn't wait to get in these clothes." And fans of Beyoncé's music take note: The Grammy® Award-winning singer will perform the theme song, and, as Xania, she sings "A Woman Like Me." slogan: "Because you're worth it". two-year contract with Calvin Klein fragrances ended. went out, but there were no reports of injury, police said. Is Nick Making Jessica Jealous ? Despite the fact Jessica Simpson once blamed the reality TV show Newlyweds for her split to former husband Nick Lachey, the starlet is ready to star in yet another reality TV program. The singer is in talks to star in her very own show. “I like the idea as it could be empowering to women to show that life goes on after a marriage. It's something I plan to make a success of in 2006,” tells the blonde bombshell. She has had a lot to deal with lately. If you have noticed, is she still the stylish Princess that we are used to looking at? Her separation from Nick has taken its toll on the singer. Nick is just going about his life as if nothing has happened. He has been enjoying his bachelor lifestyle, and has been seen with a few different women. I personally think he is just trying to grab her attention to make her jealous. He knows how much she loves him. Jessica seems to be dealing with it much harder then he is. Her friends are trying to get her to stay busy and to have fun. However, she still has not gotten over her first love. Right now, by keeping busy with her career she will bounce back to her old self eventually. In the meantime, I love looking to see what trend she comes up with next, and what's the next handbag she will carry. She definitely has become a trendsetter. Jessica, we all are pulling for you to get through this difficult time. So in the meantime lets see what this hot bombshell pulls off next. Donald and Melania Trump are due to have a their new baby Trump in the spring. The two are very happy over the joy of having a child together. Expectant mom Melania 35, who is seven months pregnant, is glowing these days. It will be Melania’s first and Donald’s fifth child. You just cannot help but imagine what this baby’s life will be like. She already hired a full-time nanny for her baby. In which a baby shower was thrown for Melania. They drank lemonade out of baby bottles, and had tea sandwiches and cupcakes which were served to all the guests. Melania received a lot of toys and Ralph Lauren clothing for her new baby. She looked more beautiful than ever and she seemed to have a glow about herself. I just cannot help but be happy for her. Living in a Trump Tower in the middle of New York City this baby will have everything its little heart will desire. You cannot ask for anything better than that!!!! Congratulations to Donald and Melania. Back in full-force, American Idol contestants show off what you call talent, or people who think they are talented. Seeing the frustrations on the faces of the judges is plain hilarious if you ask me! How these contestants can possibly think that they are the next American Idol is simply beyond me. Early episodes of the show focus on tryouts around the country, where semifinalists are selected to come to Hollywood and compete in weekly eliminations for a recording contract and a shot at fame. 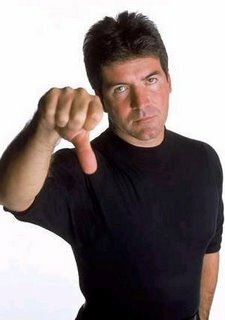 We should simply call this the “Simon Cowell Show.” He simply was at his brutal best on last weeks show. Comparing one woman’s voice to the sound of screeching cats, then having the nerve to tell a male contestant to shave his beard off and put on a dress and become a female impersonator. Which of course I felt that was too far out of line. Leaving the contestant upset and in tears. We all stay tuned only because we love to see what he says next. Between Randy, Paula and Simon it will guarantee another year full of cat fights, drama, and out of control comments of what he thinks is or should be the next American Idol. Stay tuned.